For almost 65 years, Burt and Christine Thompson have enjoyed each other’s company. The two attended Hartford Central School together, and Burt, who is six years her senior, worked on Christine’s father’s farm. But it wasn’t until he returned from serving with the army in the South Pacific during World War II that Christine had grown up enough to catch his eye. “You have to know when you go into it, it’s for life. We don’t believe it’s a fifty-fifty proposition, we believe it’s 100 percent,” Burt said. 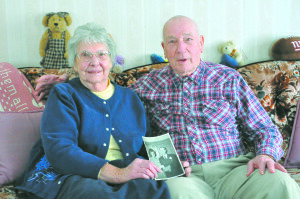 The two were married on May 9, 1948, at the Hartford Methodist Church, and now live down the road from that spot. They spent their honeymoon in Niagara Falls, and after continuing to work on the dairy farm for a bit, the Thompsons leased a store for four years. Then, in 1962, they built and operated the IGA that used to sit where the Stewart’s Shop on Route 40 now stands. Here, they spent a whole lot of time together working long, hard weeks. “Sometimes there were ups and downs, but we always ended up, ‘up,’” Christine said, adding that the store kept them busy in a good way, and their three daughters always helped out. Through running the business, they were also able to keep connected to their neighbors and community. Christine thinks everybody should be married, in order to enjoy the compatibility and comfort of one another. She said she and Burt are best friends who keep no secrets from each other. “We’ve gotten to the point now where we think alike,” she said. From Burt’s point of view, the best part of his union has been “having three daughters, 12 grandchildren and 22 great-grandchildren, with another on the way.” Pictures of all these offspring, who live throughout the United States, decorate the walls, and the Thompsons proudly described what each one does. Faith has been a strong theme in the life of Burt and Christine and their extended family. A number of various children and grandchildren have jobs as pastors or associate pastors. “That’s really where we’ve gotten most of our enjoyment — from our family,” Christine said. As far as the longevity of their marriage and their life together, the pair is clearly content. “I’m glad,” Christine said. “Yeah, I’m glad too,” Burt added. Thought Burt has a pretty daunting task in finding an innovative Valentine’s gift for his wife of six decades, she seems pretty easy. “He asked me if I wanted a dozen roses; I said no. he asked me if I wanted a box of chocolates; I said no. He asked me if I wanted a card; I said no. I told him I’ve got your love, and that’s all I need,” Christine said.